H.I.H. Saravanamuttoo,? G.F.C. 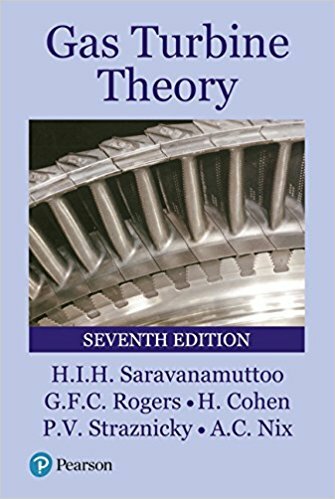 Rogers, "Gas Turbine Theory (7th Edition)"
When the First Edition of this book was written in 1951, the gas turbine was just becoming established as a powerplant for military aircraft. It took another decade before the gas turbine was introduced to civil aircraft, and this market developed so rapidly that the passenger liner was rendered obsolete. Other markets like naval propulsion, pipeline compression and electrical power applications grew steadily. In recent years the gas turbine, in combination with the steam turbine, has played an ever-increasing role in power generation. Despite the rapid advances in both output and efficiency, the basic theory of the gas turbine has remained unchanged. The layout of this new edition is broadly similar to the original, but greatly expanded and updated, comprising an outline of the basic theory, aerodynamic design of individual components, and the prediction of off-design performance. The addition of a chapter devoted to the mechanical design of gas turbines greatly enhances the scope of the book. Descriptions of engine developments and current markets make this book useful to both students and practising engineers.